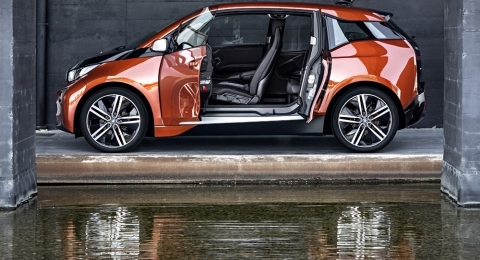 Could this, the new BMW i3 electric car be the one to break through the cacophony of Clarkson-esque nay-sayers and bring EV’s a mile or two closer to the mainstream? Certainly BMW have placed a €2 billion bet in the hope that it will, and that it will place BMW at the leading edge of innovation, where they like to be. This is my iPhone video of ‘the reveal’ but it also has some interesting thoughts from Robert Llewellyn (Kryten from Red Dwarf for those of a certain age) who has travelled 45,ooo miles in EV’s over the past few years. Range anxiety has been the focus of many critics attention and some would say perfectly reasonably. However, listen to Robert’s real world take comparing petrol power with electric. We had a brief opportunity to sit in the i3 but not to drive it just yet. It is very much a BMW and a step up in terms of concept and quality from what is on the market from Nissan or Renault. They have also done a very BMW thing and designed what they call a 360 degree service to support new EV owners and a host of options and upgrades to tempt you. Of course, this all comes at a price and while the Nissan Leaf and the new Renault Zoe are driving the entry price for EV’s down, the BMW i3 electric car comes in at just over £25,000 with the governments subsidy applied. We can’t wait to try the i3 and see if it has the ‘Ultimate Driving Machine’ DNA that the BMW brand has worked so hard to establish. In the meantime, we do have a few nagging concerns over charging point access as BMW have struck a deal with one provider (ChargeMaster) that has gone but not comprehensive coverage. Look out for a separate blog in the coming days.